Now that the holidays are over, we can finally get back to our regular eating habits — no more cocktail weenies and eggnog, right?Â It’s back to the regular every day stuff we probably shouldn’t be eating like I-have-no-idea-what-to-make-for-dinner-so-let’s-order-pizza or Don’t-feel-like-going-to-the-grocery-store-but-we-do-have-pasta. And, this is where chianti comes in. This wine, which originated in the Italian Tuscan region, is perfect for those every day simple foods. Chianti is usually made with Sangiovese grapes and often blended with other red grapesÂ and even some whites. Our chiantiÂ is made with California grapes. So, you can pair your chianti with a late-night pizza, a pasta with tomato sauce, orÂ a big, fat Italian sub. But, if you’re feeling like something a little more fancy, chianti is also delicious with eggplant Parmesan, veal or lamb. 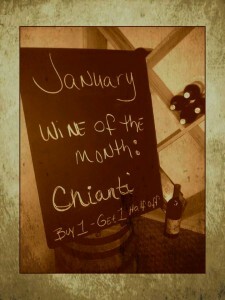 All this month, buy one bottle of our chianti and get another one half-off.